Welcome to another Feminist Friday! That time of the week where we share 3 of our fave videos that we really love, and that helps to widen the definition of intersectional feminism, and why it is important to us. This week we’re talking about the dangers of child marriage as well as celebrating female empowerment in a new campaign. 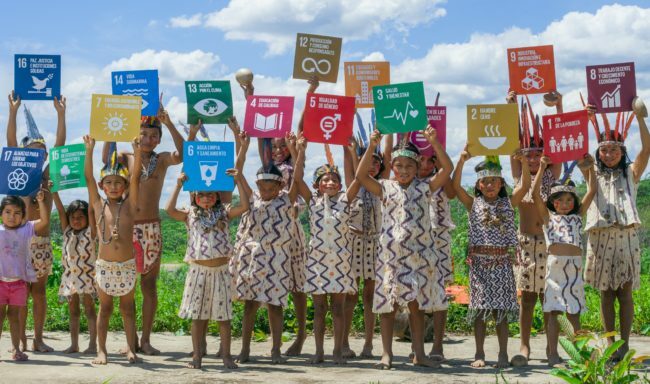 But up first is a new campaign being rolled out from the United Nation’s Sustainable Development Goals initiative aimed at helping parents teach young children about the importance of a more equal and fair world. The UN has teamed up with one of the most beloved toy brands worldwide, Thomas and Friends, and released a series of videos explaining some of the goals in ways they can understand. The ‘All Aboard for Global Goals’ series hopes to inspire the next generation of global citizens, and start meaningful conversations and learning between children and parents. Along with the videos they have made available resources like conversations starters, play tips and activities. Among the videos topics such as education, clean water, responsible consumption and sustainable communities are discussed. Our favorite was goal number 5, gender equality, which we’re sharing below. If you are looking for a fun and informative way to teach your youngster about how they can make a difference in the world, these videos are a great start. The second video comes from another global organization that raises awareness about the importance of making a difference in the world. In the video below, Global Citizen feature Reporter Tania Rashad talking about the dangers of child marriage, how it impacts girls in Bangladesh today, and how she managed to escape the culture that entraps so many vulnerable girls. “I knew there was something greater for me, so I fought back,” says the sexual assault survivor who reveals there is long-lasting impact when girls are forced into marriage at a young age. This is why the Sustainable Development Goals and other similar programs stress the importance of education, healthcare, and financial stability as they play a large role in reversing harmful cultural norms such as child marriage, and offer better opportunities for girls and their families. Our final video comes from California lifestyle footwear brand Sanuk, whose ‘Collaging The Lines’ campaign and short film is a celebration of female empowerment and self reassurance. Celebrating the art of being a fearless female, Sanuk brings together four of their women ambassadors from all different backgrounds to come together for trip in Mainland Mexico – featuring pro surfer Paige Alms, the world’s youngest certified yoga instructor Jaysea DeVoe, photographer and surfer Cori Barnick and artist Susan Wickstrand. The four inspiring, über-talented, powerhouse females came together in a new way to celebrate the interchange of their favorite things—surfing, yoga, art, stoke, health and wellness. The journey is about women collaborating, connecting and sharing sincerity and a personal look into keeping a positive mindset. ‘Collaging The Lines’ depicts what it’s like to be a woman today —exploring, teaching and learning how to be comfortable and radiant in your own skin. The short film brings these women together as they cross-step the line between life as art and art as life at a stunning retreat. The women openly share their insecurities, vulnerability, and coming to a place in life to accept these feelings. The film serves as a motivational example of feeling comfortable with who you truly are feeling empowered by having a voice and opinions.